Home / Black – U.S.
American Blacks are defined by a cross-section of nearly 5,000 African Americans from all parts of the United States. They are also referred to as Black Americans or Afro-Americans, and formerly as American Negroes. Their largest ethnic component is Sub-Saharan African. Between the sixteenth and nineteenth centuries, about 15 million Africans were transported to the New World as slaves, primarily from West Africa, Angola and Mozambique. African Americans possess, on average, about 25-30% Caucasian (white) ancestry. Southern African Americans in particular also have a significant amount of American Indian heritage. There are six data sets that have been incorporated into DNA Consultants’ method. 1) The Black – U.S. population data represent a broad, national group of 105 DNA profiles from African-American individuals who also are part of the FBI’s DNA database. These autosomal DNA samples were provided by the University of North Texas Health Science Center, in Fort Worth, TX, among other centers. 2) The Black – U.S. population data represent a broad, national group of DNA samples from 139 African-American individuals who also are part of the FBI’s DNA database. Samples were processed by the Promega Corporation, located in Madison, Wis.
3) The Black – U.S. population data represent samples from 195 African American individuals throughout the United States with no geographic preference. Samples were provided by Laboratory Corporation of America. 4) The Black – U.S. population data represent a broad, national group of DNA samples from 200 African-American (African American) individuals that are part of a database maintained by the Serological Research Institute in Richmond, Calif. Research was partly supported by a grant from the A. Reed and Virginia McLaughlin Endowment Fund of the California Association of Criminalists (C.A.C.). 5) The Black – U.S. population data represent a broad, national group of DNA samples from 258 African-American individuals. Samples were obtained by the Biotechnology Division of the National Institute of Standards and Technology (NIST) in Gaithersburg, MD. Research was partly supported by the National Institute of Justice through an interagency agreement with the NIST Office of Law Enforcement Standards. 6) The Black – U.S. population data represent 3,927 self-identified Black individuals in the United States sampled in 2003 by Orchid BioSciences in East Lansing, Michigan. 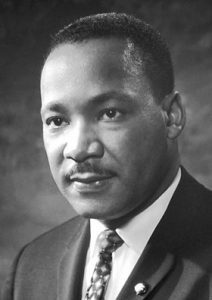 Photo: Martin Luther King Jr, American Baptist minister and civic rights activist, in 1964. Photo by the Nobel Foundation. Source publications: Population Data on the Thirteen CODIS Core Short Tandem Repeat Loci in African Americans, U.S. Caucasians, Hispanics, Bahamians, Jamaicans, and Trinidadians, JFS, 1999, 44, 1277-1286. Allele Frequencies for Fourteen STR Loci of the PowerPlex 1.1 and 2.1 Multiplex Systems and Penta D Locus In Caucasians, African-Americans, Hispanics, and Other Populations of the United States of America and Brazil, Levedakou et.al, JFS, 2001, 46(3) 736-761. ABI Profiler Plus / Cofiler Users Manuals. Population Database For 9 STR’s In 3 Populations, CAC Fall 1998. Allele Frequencies for 15 Autosomal STR Loci in U.S. Caucasian, African American, and Hispanic Populations, JFS, 2003, p908-911. Genetic Analysis of Large data Sets of North American Black, Caucasian, and Hispanic Populations at 13 CODIS STR Loci, JFS, 2004, p1381-1385.